IPL 2019, the most decorated tournament of cricket is nearly halfway through. Every team has performed to their limits and we have witnessed some rousing cricket action thus far. As we move into the second leg of the tournament, it’s interesting to note the performance of the teams thus far. CSK with six wins from seven games is comfortably placed at the top with KKR securing the second position with 8 points. On close observation, every team apart from CSK has had a roller coaster ride. Even CSK scampered home on a couple of occasions in close encounters. RCB proved to be a disappointment thus far and are looking for a way to turnaround things. Much like the earlier versions of IPL, we have seen some memorable knocks, close encounters, breathtaking catches, spirited bowling performances, and nail-biting finishes. Today we are going to witness two teams that are yet to have a title behind their names clash against each other. Yes, we are referring to RCB vs KXIP. An inconsistent KXIP will be looking forward to streamlining their journey with a win against the battered and bruised RCB on their home turf at Mohali. On the other hand, RCB which had a rough journey so far with six straight losses on the trot and suffering the ignominy of encountering six straight losses will be looking to break the shackles off with a win. While KXIP has the likes of K L Rahul and Chris Gayle in form and a solid middle order in Mayank Agarwal & Sarfraz, RCB has been suffering from some serious inconsistency with none of their batsmen making a mark consistently despite Virat Kohli & AB De Villiers sparkling in some matches. KXIP’s bowling looks solid with skipper Ravichandran Ashwin leading the pack ably supported by Sam Curran and Mohammed Shami. Whereas RCB has plenty of bowling owes. It is because their bowling has come as a cropper, their team is not able to defend big scores. KXIP has the head to head advantage with 12 wins in the 22 matches they played between themselves. However, RCB can draw solace from the fact that they have won 3 matches out of the six matches they have played at Mohali. Kohli and Chahal are the leading performers in the batting and bowling department in the encounters between both the teams. Playing under pressure has always brought the best out of Virat Kohli. There couldn’t be any better opportunity than here to break the shackles and register their maiden win. But RCB needs to be wary of the fact, KXIP has won seven matches on the trot in this ground. All said we are in for a cracking encounter tonight at 8 PM. On this eventful day, to make your IPL adventure more stoking, we have a couple of exciting offers for you. Predict the winner between KXIP and RCB after making a minimal buy-in of Rs. 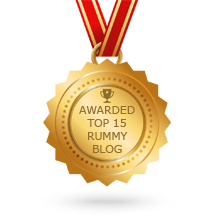 10 to play our Rummy Fantasy League at 9 PM. Registration is open now. If your prediction turns true, you will reach s receive the double of what you win. 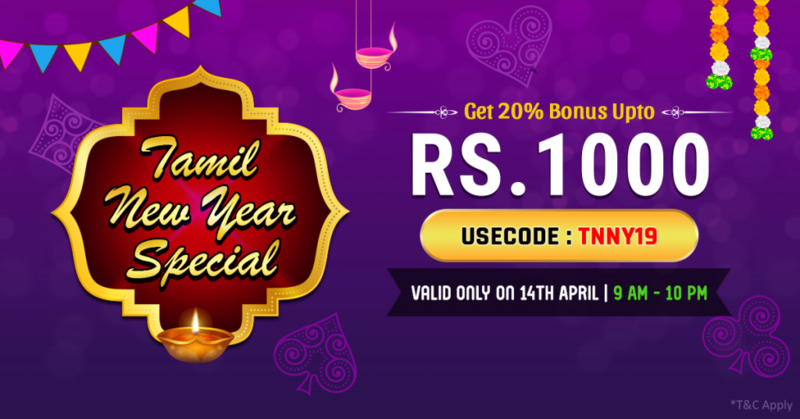 Isn’t that a superb offer that goes along with the IPL excitement? Register now and set the tables ablaze with your skills. 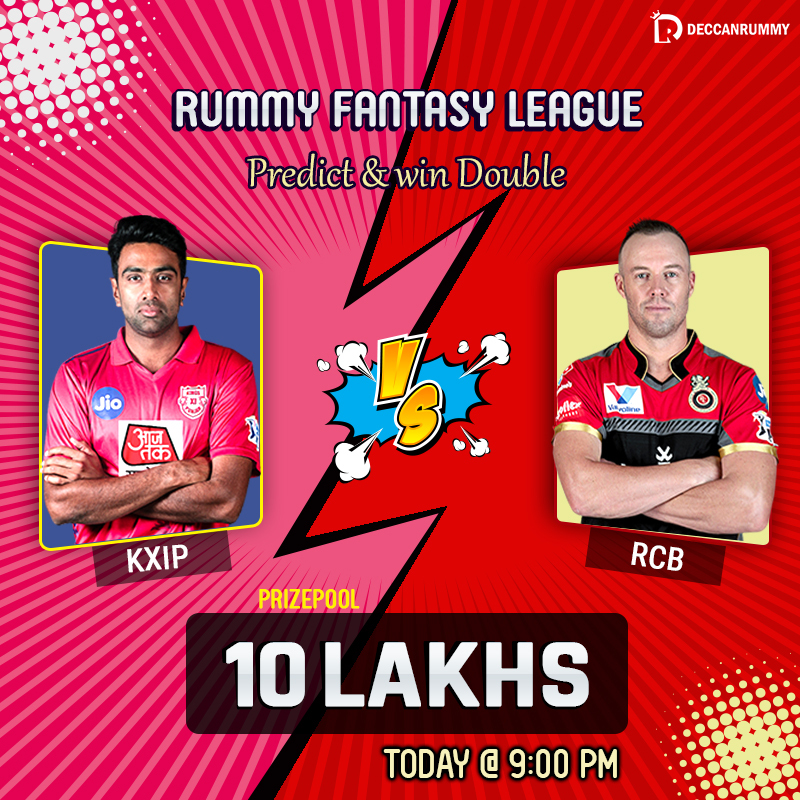 Deposit any amount with the code “KXIPVSRCB” after which you will receive a popup asking you to pick the winner between both the teams. Pick your choice which will be autosaved. 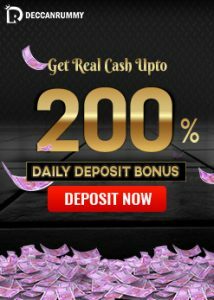 Play Cash Rummy games after deposit. If your prediction comes true, we will credit a cash bonus at the ratio of 10:1 for the loyalty points that you generate by cash rummy games from 3 PM – 10 PM and also your loyalty points will be available for redemption as per the general rules in the main account. We are sure that both of these offers are a great fit for this IPL excitement around and would enhance the fun. So, avail these two stunning offers and make your IPL nights more memorable. 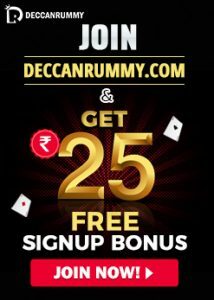 In the meanwhile, do check our exciting rummy promotions lined up immediately also. We are waiting for you at our tables! See you around!